Betula (Birch Trees) or Silver Birch Trees such as Betula pendula, nigra, alba and Betula jacquemontii are one of the most popular ornamental trees in Australia. Betula species include Silver Birch and Weeping Birch trees. Some Silver Birch trees are smaller growing, great for small gardens. 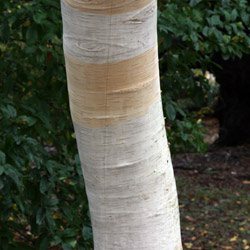 Growing well in a humus rich well drained moist soil Silver Birch Trees are suited to cool to temperate climates, they will grow in full sun to part shade. Silver Birch trees tend to have shallow root systems and like most trees the root system will seek out water. Root barriers are a way of containing root systems, consult your local council or water authority for advice and information for your area. Silver Birch are the most popular species. Silver Birch are used in landscaping as feature trees. The standout white trunks adding a focal point to any garden.